Hello December! As much as I cut out of our schedule this year, it still feels like we're on the Holiday Carousel ride, going from one thing to the next. It has gotten worse since my oldest 2 have been in school all day. We still have the same regular stuff to do after school (chores, practicing instruments, making dinner, etc. ), but this month we add to that shopping! And parties! And special events! This week is the busiest, with something going on every evening (and 2 things Saturday morning) through Sunday. The poor little Advent calendars are hung at the end of the hallway, but have yet to even be filled with candy. I've told the kids it's their job to fill up their own calendars this year. When they were still preschoolers, I came up with super fun activities to do for each day. Unfortunately, that has gone by the wayside. I just don't know when we would squeeze one more thing in every day. So they get to put a piece of Halloween candy in each pocket and call it good....and even that hasn't happened yet. All of that to say, this poor blog space has been a bit neglected this month, but I'm going to attempt to remedy that. 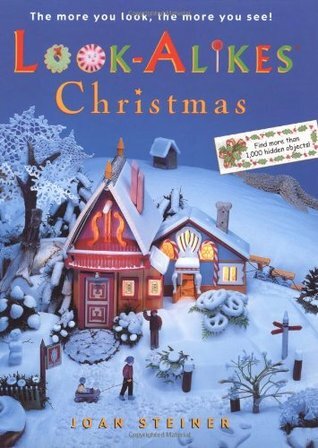 One of our favorite traditions each December is bringing out the Christmas book bins. We have 2 (so far). They are currently mostly picture books, with a handful of board books and a few chapter books too. 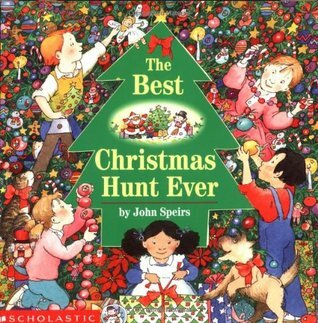 They stay out all month, and nearly every day finds us reading through a big stack of Christmas books. We love it! So I'm going to do a mini-series sharing some of our favorite Christmas picture books with you. I hope you'll return the favor, because we are always eager to find a new favorite! I'm starting out with Seek-and-Find books. I taught Joy School this week for my 4-year-old (and 5 of his friends,) and during every bit of "free play time" we were all huddled around these books. At first I had all 6 kids trying to share the book I was holding. Then I realized we have several. Problem solved! A group of children are off to stay with their friends' grandparents in the country. Find the children, plus extra things, not to mention Santa's elves! This would be a good starter puzzler book, as the scenes aren't nearly as packed as in some of the others. Plus, the last few pages of the book have the solutions! Put out by Scholastic. Amazon only has this available from 3rd-party sellers (which is what the link above goes to.) One to look for second-hand. 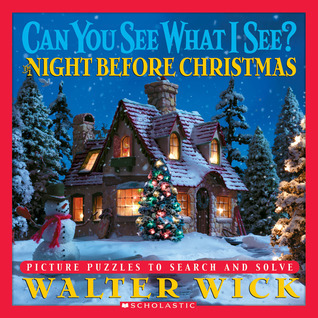 Where would our little puzzlers be without the incomparable Walter Wick? This one is more geared toward older kids, as the list of things to find (written in rhyme, as usual), is all in text. Or it's a great one for an older sibling to pair up with little brother or sister and work together. This is another one that is great for younger kids, because the items or people you are supposed to find are drawn on the side. Frosty is in each picture, as well. Then, like many of these types of books, the back endpapers have an extra list of things to find for each page (just written out this time). Humor abounds in the packed illustrations. Full 2-page spreads, with the strip of words at the very bottom telling you what to find. A classic! 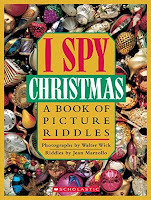 Have you seen these books? They are a lot of fun. Rather than looking for specific objects in the illustrations, your job is to notice all the objects Steiner used to make something else in her miniature worlds. Crayon lampposts, sea-shell snow, and an eraser chimney are just a few noticeable look-alikes from the cover. This is not one I own, but I just found it at the library. I had forgotten about this series! It's a fun twist on the usual seek-and-find genre. A couple last hints for finding more of these at your library. 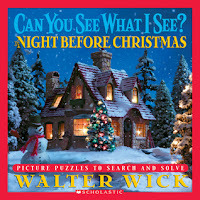 On your library's online catalog, do a search using the term "picture puzzles." When I did that just now a list of 98 popped up. It makes me want to go check out a bunch more! If you only want Christmas-related ones, though, it may be faster to just browse your library's holiday picture book collection instead. You can also look in the J 741.5 section for a start. That's where my library has the Where's Waldo books.